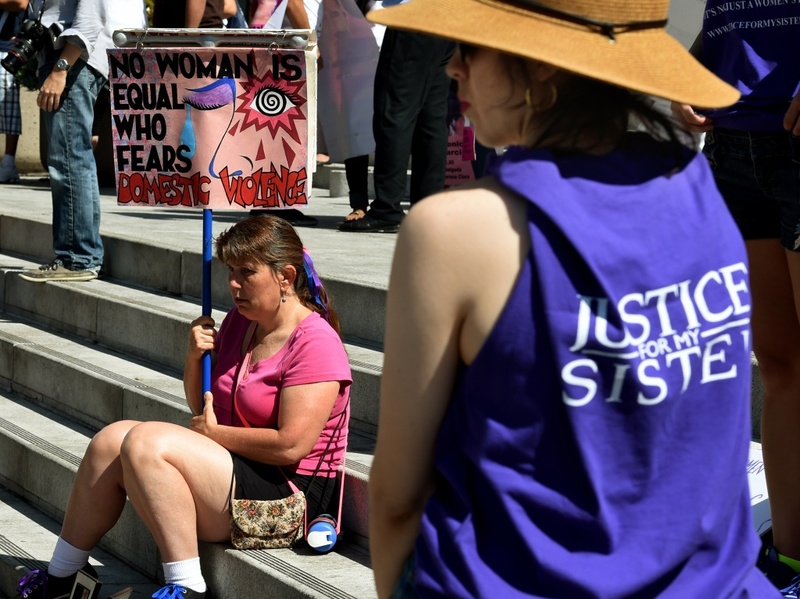 A woman protests against domestic violence as she joins other women's rights advocates in an International Women's Day march in downtown Los Angeles, California on March 8, 2015. Domestic violence often leaves victims feeling isolated, trapped or embarrassed. Whether you’re seeking help for physical or emotional abuse, it can seem impossible to find the help you need. In the wake of last week’s tragic murder-suicide at San Bernardino’s North Park Elementary school, some victims have felt compelled to come forward and share their stories of domestic violence. And on AirTalk today, we’re asking listeners who have survived domestic violence to share their stories with us. When and how were you able to put an end to the abuse? What advice would you give someone who is too afraid to seek help? Call us at 866-893-5722. Can mindfulness curb domestic violence? House unveils Dodd-Frank replacement, but will it go the way of ACA repeal?